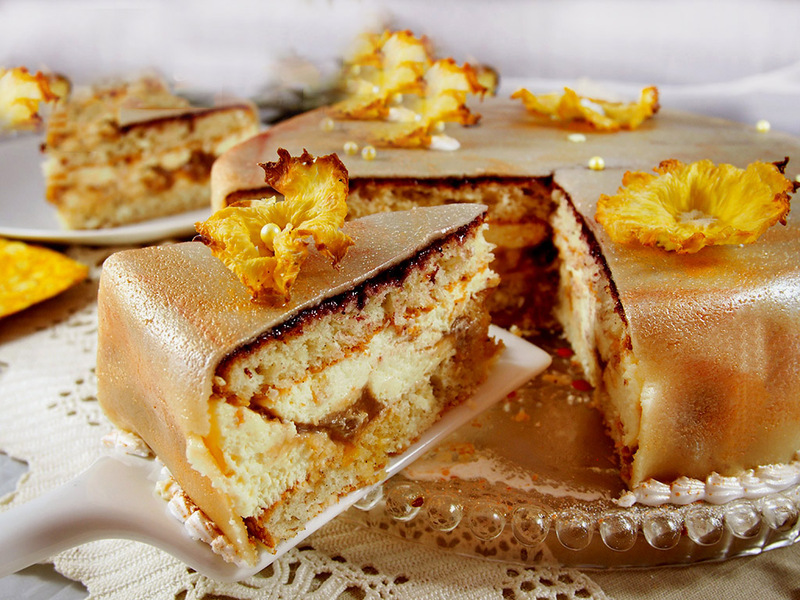 Tasty pineapple coconut cake prepared with an easy recipe. For swamps, blow eggs together with sugar and vanilla. Add yogurt and oil. Mix flour, coconut and baking powder. Pour them into the dough and mix well. Cover a cake form with baking paper. Heat the oven to 170 degrees and bake the swamps for about 30 to 35 minutes. Let it cool down and cut it horizontally in two. For caramel, put oil and sugar in a non-stick coating. Caramelize to a nice brown color. Remove the caramel from the hob and carefully and gradually pour the cream. Stir to homogeneity. Add pineapple and return to the hot plate. From the fruit juice caramel is liquefied. Let it boil for 10-15 minutes until it thickens again. Its consistency should be like a thick sauce and bubbling on the surface. Let caramel cool to cool. Prepare the cream for the cream from the previous day. Heat to boiling and pour in coconut. Let it stand in the refrigerator for at least a few hours to be cold for breaking. Then straighten it. Prepare a vanilla pudding with only half the fresh milk of the indicated amount of pack. It needs a concentrated flavor, not a fluffy and light cream. Separate the cream of snow separately. Dissolve some water in a water bath gelatine. Mixing with the mixer add the gelatine to the thick pudding and then the cream. Assemble the cake by placing one half of the swamps on the bottom of a flat plate. Tighten it with a removable cake ring or use the cake ring. Pour the cream and pour the caramelized pineapple over it. Stir carefully with a fork so the fruit can sink here unevenly. On the cream put the second swamp and press down well to get a good solder and shape. Store the cake in the refrigerator for at least 6-8 hours. When serving, remove the ring and decorate as desired. Let it be sweet to you! The cake is 26 cm in size. I baked the dough for the two swamps separately, not all at once, but this is a matter of your choice. The amount of gelatin for the cream is small, but I did not want to have a texture of jelly, just to be tight. You can increase the gelatin of 1 packet, ie. at 7 years. If you do not have fresh pineapple you can use a can of fruit but well drained. 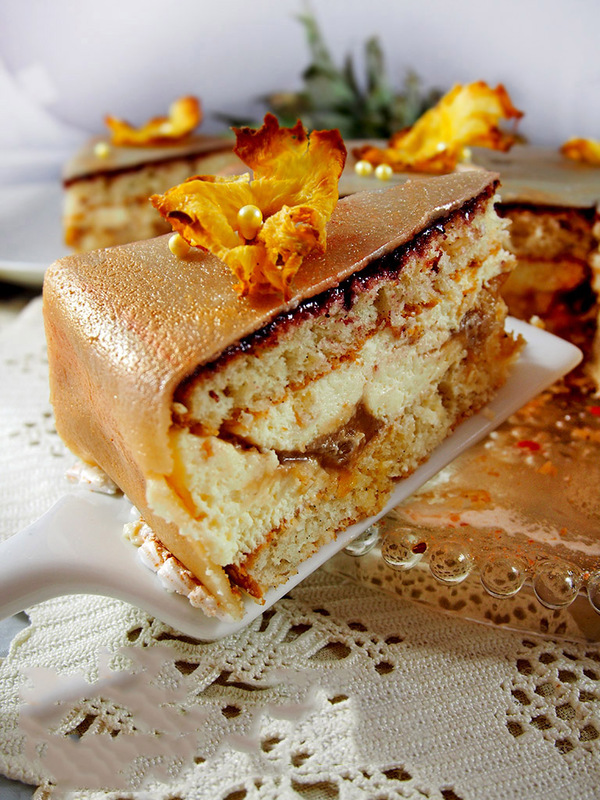 Otherwise, you will need to cook caramel for a longer time to thicken. 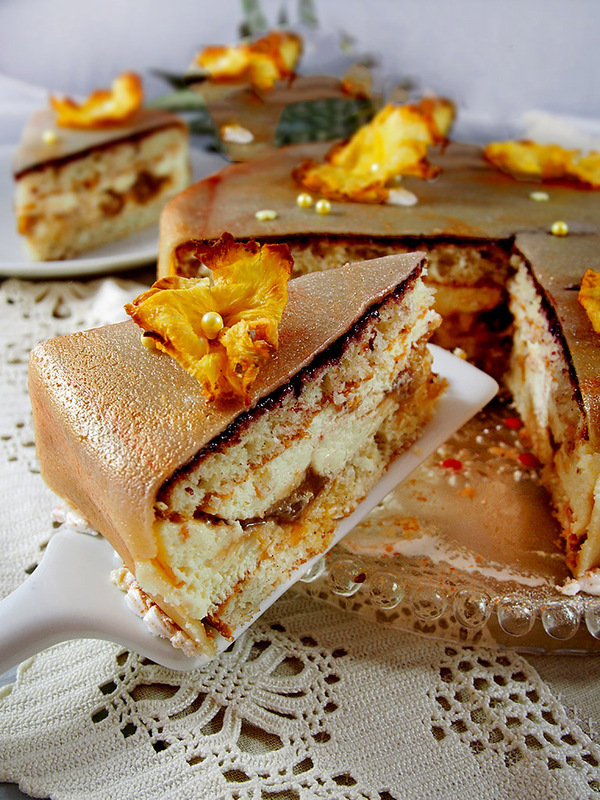 I have covered the cake with a distended almond marzipan and the decoration is from dried pineapple. If you want, decorate as you like it.